Golf. No one knows exactly when it was invented, but the 13 original rules of golf were written in 1744, one of which included that if your ball hit a horse or a dog you must play that ball as it lay. It is, in essence, a game where you walk six miles with twenty to thirty pounds on your back to hit a tiny ball with metal or wood sticks into eighteen holes amid sand, well groomed grass, and perilously placed ponds. If you are talented enough you can make money doing this. But, for the average human being, you just play. You play with your friends, you play with your family, and you play in hope that you will get a better score than the last time you were on the course. On April 29, David and Sheilla Snell, along with my husband Tim and I, played in The Pharaoh’s Cup Tournament in Villa Rica, Georgia. The Pharaoh’s Cup Tournament, sponsored by the Omicron Phi Lambda chapter of the Alpha Phi Alpha Fraternity and The Fuller Center, was the first time that I had played a round of golf in over five and a half years. The Pharaoh’s Cup Tournament was a scramble, which is also known as a best ball tournament. This means that you play in groups of four and each player takes a shot from the ball with the best lie. This type of play tends to increase the speed of the tournament and is a great deal of fun for professionals and beginners alike. 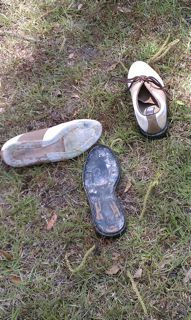 As you can see from the picture, I managed to lose a sole of my shoe on the golf course. When I noticed on the second hole that my shoe felt a little strange, I glanced down and saw that half of the sole of my left shoe was beginning to fall off. By the end of the hole, I was carrying both my golf club and the sole of my left shoe. I managed to finish the hole and start the third hole with only part of my left shoe before I got the chance to change into a pair of tennis shoes. It was frustrating, but it certainly made the day more interesting. The Frog Golf Club was a beautiful course. It was one of the most difficult that I have ever played, and one of the most exciting. The people from the Alpha Phi Alpha fraternity were wonderful and welcoming. I had a great deal of fun playing with David and Sheilla, and I am looking forward to many more rounds of golf with them in the future. It is my hope that we will be able to play in the Pharaoh’s Cup Tournament again next year, and that maybe – just maybe – we won’t come in dead last. Golf is a game that I grew up with. This does not mean that I am wonderful at it. It means, mostly, that I find a simple joy at walking onto a golf course at eight o’clock in the morning, when the dew is still fresh across the perfectly trimmed grass. Every time I walk on to a course I am flooded with hundreds of memories of Saturday mornings of driving ranges instead of cartoons, blisters, sunburns, and that first birdie. A part of my soul will always belong to dew-soaked grass, treacherous sand traps, and brackish water filled with ducks, geese and a wishing well of lost golf balls of those who played before me.